It is very important to have your hiring practices defined. A common practice in India for prospective employees is to use referrals, whether it be of politicians, bureaucrats or JV partners to push their resume and be considered without going through the defined processes. Majority of best practice companies have devised processes and systems to deal with these pressures and do not accommodate such requests. It is advisable to manage such requests and include such candidates as normal process candidates only. Education institutions in India gain undue weightage during the hiring process. This too has to be neutralised during the process, as the candidates work experience and accomplishments contribute to success. Education system in India for an average citizen will expect completion of a Graduate degree (10+2+3) and in most cases a Post Graduate (Masters) degree. These candidates should not be considered over-qualified for positions and roles, the concept of over-qualification has not yet established in India, as the education and role performed are not perfectly synchronised in majority of the applications. Therefore it is appropriate to have a minimum qualification requirement, but not a highest qualification ceiling. Like any candidate across the globe, candidates in India too fudge their resumes, more from a prospective from making their resume stand out rather than from a prospective of cheating the prospective employer. For each job advertised, you should expect a decent number of responses, classified as junk and non-junk. Junk, here refers to resumes, which would be totally irrelevant to the job advertised. In order to attract resumes for your company, it is essential to advertise, whether through job portals, there are 2-3 prominent ones in India or through recruitment consultants, who would be happy to partner with you. Both job portals and recruitment consultants have a wide variety or offerings and costs associated. It is advised to go through reference check and identify your needs to understand what suits best. Specially, when considering using a recruitment consultant, be mindful of the consultant’s credibility. Ideally atleast 2 to 3 recruitment consultants should be used for servicing your assignments. There is no specific guideline which defines what is appropriate to ask and what is not appropriate to ask in an interview. However, best practices in India have ensured that the interview questions are in line with the US and European norms. The only questions which need to be avoided are on political, caste and religious beliefs, these may not have a strong legal backlash, but, will impact the employer brand significantly. Some key areas which should be checked with people when being interviewed are on their comfort level for commuting to office and to their acceptability on a particular salary range. Salary still holds a key in the decision making process for candidates and employees. It is essential that you plan which percentile you would like to position your company at. While a lot of free data on salaries is available, it is highly recommended to engage a professional HR consulting company to carry out salary benchmarking exercise. Depending on your overall strategy, decide the percentile where you would like to position your company on compensation. While the positioning varies and is largely dependent on your strategies, anything below a 60th percentile is normally not going to position the company as an employer of choice. Salary break-up or components of salary are worked on the menu system, wherein, an employee chooses the amounts under each head depending on his or her expectations and tax planning. Some companies, especially in manufacturing sector, exclude employers Provident Fund contribution from the CTC, while other include both contributions of PF to the CTC of an employee. This is a decision as a company that needs to be taken. In the initial stage it is important to have clarity on what culture you intend to build in the company. As a next step, a strong process should be there to see how it is percolated down to every employee and is strengthened during day to day interactions. It is also a common phenomenon to have the workplace culture which is influenced by diverse religious beliefs and in some cases it is influenced by the physical location of the office. But, by far, the Indian workforce is adaptable to a workplace culture which assists in enhancing their workplace experience and doesn’t interfere in their religious beliefs. The essential aspect therefore is to have a strategy to build the culture with some design, else a varied, non-uniform and non-productive culture will set in. which may or may not be beneficial to the company. Policies governing the life of an individual employee in the company are essential. It is useful to have a shorter version called “HR Manual”, which is available for reference of all employees and a detailed booklet which is available for the benefit of a few top management individuals. This serves as a guide when running people processes and systems in the company. Few key policies that should be covered in the manual are leave, zero tolerance to sexual harassment, recruitment, exit, compensation, travel and terms of work policy. Like any group of workers wanting protection or a body to help pressure their rights, the workers in India too get organized and form unions. The genesis of union is to act as a unified entity which represents the voice and beliefs of the workers. Similar to global workforce, member of Indian unions and their leaders see various benefits, which can be advantageous and in some cases non advantageous. Hence, the purpose of the unions gets diverted. By far the Indian worker appreciates if he is treated fairly and if he is given a fair hearing by the top management. The key therefore in managing the workforce is to involve them in decisions that impact them and have a system of constant communication between workers and top management. Eventually, the worker is looking for an ability to manage his family and be assured that he is not being exploited. Building the leadership team is one of the most critical factors in setting up a company. While people from same industries can quickly adapt, it is not essential for success. People adapt and if similar exposure is there from similar industries, such candidates should be looked at. It is an important decision on how you position their salaries, this will go a long way in building a strong foundation for the venture. It should be pegged atleast 10 to 15 percentile higher than whatever is your planned positioning for rest of the company. Do spend a lot of time doing reference checks, including those on credentials and performance. Contrary to popular belief, it is not a common practice for people to shift jobs very often, an average tenure of 2 to 3 years in the current assignment should be looked at, this will help you see whether the employee has run any delivery cycles and how he or she performed in those. Leadership here does not necessarily refer to level of employees. It also goes beyond and includes the first few hires, the foundation team, and those responsible for establishing functions. It is this group of employees who set the employer brand of the company. One of the key aspects of doing business is background checks, and this applies even to vendor selection or empanelment. While, for every vendor, the process of tendering may not be required, it is essential that you spend time meeting the vendor, its employees and talk to some of their existing clients. It is also essential to clearly articulate your business values and needs to the vendor before starting a relationship. This will ensure a smooth and efficient functioning of the relationship. It is planning the people agenda which will have a major impact on the primary deliverables when setting up a new venture, so do spend time and effort in getting this right. An alumnus of Indian School of Business, Hyderabad, XLRI, Jamshedpur and IIM-Bangalore, Mandeep Singh, Partner – HRhelpdesk® is focusing in the areas of Talent and Rewards. 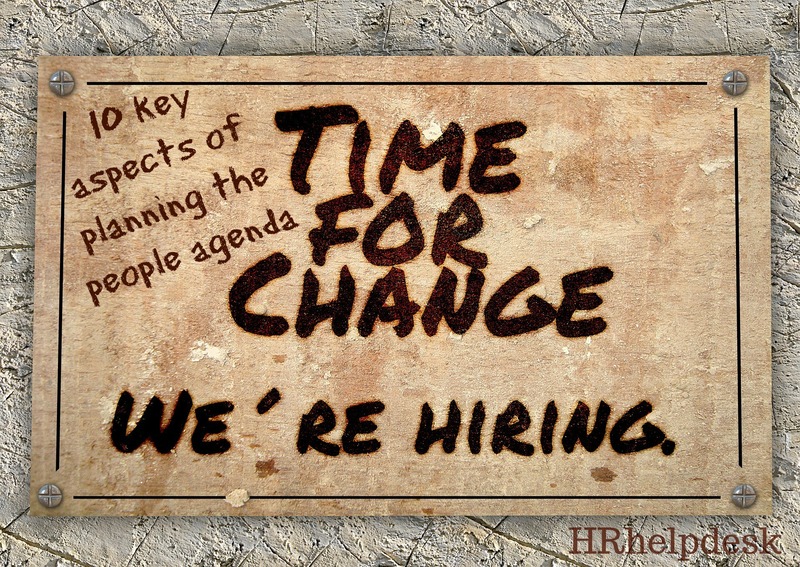 HRhelpdesk® offers a complete range of cost effective HR solutions for managing an organizations “People Agenda”. From managing the HR function to drafting policies, from setting up a Query Desk to Employee Engagement, from Policies Orientation to POSH Training Delivery, from Employee Satisfaction Surveys to Salary Benchmarking Studies, from Internal research to public surveys. Specialised HR Consulting support enables an organization to manage its HR needs effectively and is focused on promoting the internal HR to the next level.